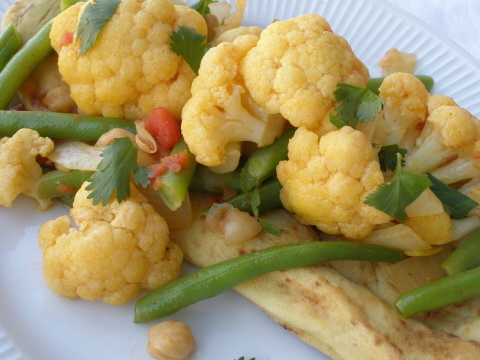 I was cruising around the blogosphere the other day and stumbled on to Cauliflower and Chickpea Curry posted by Kevin over at Closet Cooking an incredibly prolific and wonderful food blogger. Fantastic photography too. Now if I could just get my smell o' vision to work properly. It has been suggested that I prepare an Indian style pizza and so I guess Kevin was my muse. Don't be concerned Kevin, I am totally harmless. For the most part. I halved the Cauliflower and Chickpea Curry, the original recipe is here. It was light, and delicate. A wonderful compliment to the naan I picked up. It looks as though I have been having a vegan food obsession. Perhaps I am. I am not vegan, maybe part-time vegetarian, but certainly not vegan. I don't think... is denial the first step to acceptance? cilantro - chopped - whatever you do don't skip this. Delicious!!! Heat oil in large pan. Add the onion and curry powder and cook until the onion is tender, about 5-7 minutes. Add the garlic and ginger and cook until fragrant, about a minute. Add the tomatoes, chili sauce, cauliflower, chickpeas and water and bring to a boil. Reduce the heat and simmer, covered, until the cauliflower is tender, about 10-15 minutes. Add the green beans and cook until they are just tender and still crisp, about 3-5 minutes. Serve over naan and garnish with cilantro.